With the wine aerator pourer, you can aerate any red, white, or rose wine thus releasing the bouquet of aromas and oxidizing your wine and thus making any bottle taste significantly better. 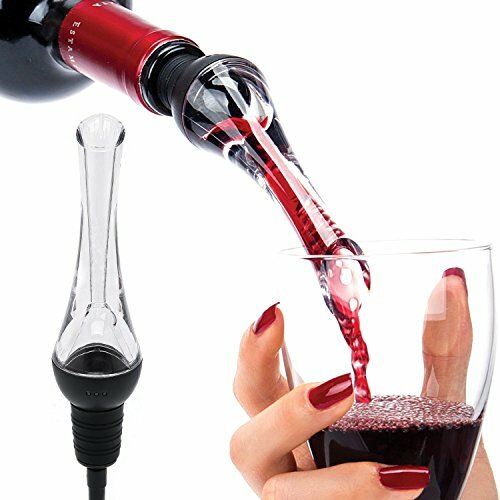 Watch the dual changer create the bubbles while you pour your favorite glass of wine. Acrylic made for easy attachment that allows hands free aerating. No need to use two hands with each pour of wine. After use, simply rinse with water and use for your next wine adventure. Working Principle: When wine is poured in it, it\'s internal design creates an increase in the wine\'s velocity and a decrease in its pressure. This pressure difference creates a vacuum that draws in air which is mixed with wine for perfect aeration..